I can't imagine owning vineyards on the slopes of Mount Etna, Sicily's still active volcano. First, I'd be looking over my shoulder a lot. Second, the volcanic rock from molten lava would seem inpenetrable. But it hasn't been inpenetrable for centuries. In fact, some of the vines in the Etna region are more than 100 years old. Growers simply break up the rock and let the vines reach through the heavy nutrients in the fertile soil in their search for water. Etna, a DOC since 1968, is a trendy growing region today as Italian winemakers have been buying up property in the last several decades. Expect to hear more about wines from the Etna region. 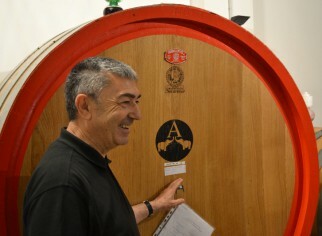 One producer new to the region is Giovanni Valenti, a well-established businessman who launched a second career in wine. Valenti grew up in Catania, Sicily and always dreamed of making wine with his father on his home island. They bought a nearly abandoned vineyard in 2009 and a dilapidated distillery to make the wine. Since then they have bought several more vineyards to amass a collection of nearly 100 acres. I met with Valenti recently to taste his wines. The grape varieties are hardly well known: the top red variety is nerello mascalese and the top white grape is carricante. Catine Valenti wines are named after writers, operas and other products of Italian fine art history. The red 2013 Poesia ($50) was medium body and is compared to something between a nebbiolo and a pinot noir from Burgundy. It was light colored and had the texture of a slightly aged Marsanay, Valenti said they aged very well. I wasn't as impressed with the red wines as I was with the 2017 Enrico IV ($28) made from carricante grapes. It had intense aromas and a rich texture that reminded me of a premier cru burgundy. I bought several bottles. What I love about the wines from the Etna region is that they are unique. And, when you're tasting chardonnay or sauvignon blanc most of your life, unique is good.